A vacuum furnace control system is a major capital investment that affects every aspect of your thermal processing capabilities, so choosing the right system can feel like a daunting task. It doesn’t have to. Simply follow these guidelines to ensure you get a vacuum furnace control system that meets your needs and delivers exacting and reliable performance. Precision and reliability that reduce errors and enhance the efficiency of operations. Internet connectivity to facilitate remote operation and make data gathering a snap. Pre-programmed precision settings and recipe management to ensure consistent excellent results. Automatic data logging to meet industry requirements and make data collection and storage simple. Controls that are intuitive and easy to use, saving on training and allowing more employees to operate the device. This is particularly important as experienced operators retire. If your vacuum furnace control system is aging and suffering from downtime, or if it’s costing you findings in your audits, it’s probably time to explore an upgrade. Vacuum furnace control systems vary widely in cost, features and capabilities. Consider both your current and future needs when evaluating options. Depending on the industries you serve and the standards they follow, such as Nadcap, AMS2750, CQI-9 or others, your needs may vary. No matter what, we recommend devices that work with SpecView software, which is the industry standard and offers a seamless human-machine interface (HMI) that’s simple to use and backed by non-proprietary open-source software and hardware. This allows you to change vendors painlessly and access parts and upgrades without being locked into a particular provider. Imagine investing in a proprietary system and having the provider go out of business or demand unreasonable rates. Custom doesn’t have to mean that you’re stuck with one vendor. Budget is, of course, a major factor. Rather than trying to upsell you, the provider will work with you to find solutions that meet your present needs while being able to grow alongside you farther down the road. 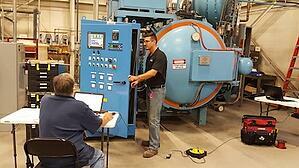 A good vacuum furnace system should be customizable, scalable and offer design flexibility. Your needs may change, so make sure your new vacuum control system can change with you. Work with a provider who listens to your needs and has the experience, breadth of offerings and engineering capability to ensure success. That takes deep know-how and understanding of the temperature control and processing industry. Ask around and find a provider who has a track record of similar jobs and has left satisfied customers in its wake. Remember that you’re not buying a product—you’re buying an entire vacuum furnace control system. Work with a vendor who does more than sell and install. A good provider will listen to your needs and build the exact solution that meets those needs. To see one of these upgrades in action, see how a process control upgrade boosted results for a fastening system company.